We’re finally there with issue 1 of THE LEVEL CROSSING (see HERE). THE LEVEL CROSSING is the new occasional journal of poetry and poetry-related prose from Dedalus Press. This first issue includes new work by poets from Ireland, the UK, the US, Australia, Canada, Poland and Korea, among others, poets already associated with the press as well as more than a dozen writers with no previous connection. 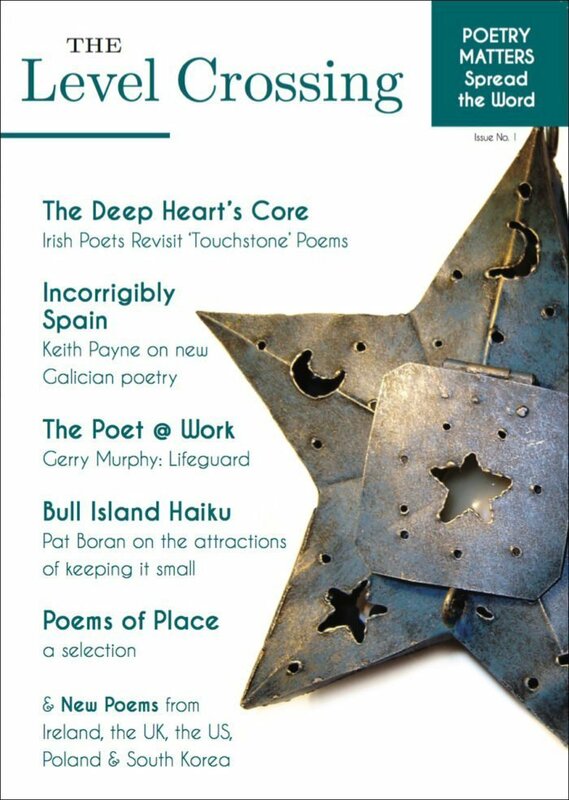 The issue features a report by Keith Payne on the new Galician poetry, Gerard Smyth on B.H. Fairchild, Vincent Woods’ writing on Macdara Woods’ new book, Music From The Big Tent, and Pat Boran on the attractions of haiku and landscape. There are new poems by Catherine Ann Cullen, Doireann Ní Ghríofa, Jane Williams, Tom Matthews, Hanyong Jeong and James Silas Rogers, among others. Gerry Murphy writes about being a poet / lifeguard, and Grace Wells considers the poem ‘Selkie Moment’ from her recent collection, Fur. There’s a sample of contributions – by Karl Parkinson, Jennifer Matthews, Paul Perry and Jessica Traynor – from the forthcoming anthology The Deep Heart’s Core: Irish Poets Revisit Their ‘Touchstone’ Poems. And we’re delighted to present our feature on ‘Poems of Place’, the poems being drawn from over 900 submissions received in a recent open call for submissions. In putting together THE LEVEL CROSSING, we set ourselves the target of producing a magazine that, in content, feel and attitude, was positive, outward-looking and, not to overstate the case, didn’t look like it was produced in the 19th century. For a first issue, we’re happy and excited with the result but can see lots of ways we could further improve. With a bit of luck, we’ll get that chance: after all, the barriers come down, but then the barriers also go up again!